My dad was a machinist and tool-and-die maker by trade, back in the day when everything was done by hand and computers were the stuff of science fiction. He sharpened his own drill bits and made his own special cutting tools. 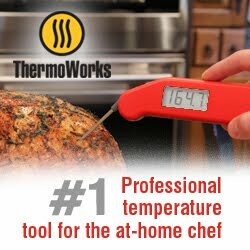 Just before Thanksgiving rolled around every year, he'd take his sharpening skills into the kitchen to take care of the kitchen knives, because there's no way he'd carve the turkey with a knife that wasn't razor-sharp. I can remember the soft skrishhh-skrishhh-skrishhh-skrishhh as he ran the knife over the sharpening stone, moving from the tip of the knife to the hilt until the the knife was deemed sharp enough. It seemed like it took hours. Maybe it did. It was hypnotic. And when he was done, every knife was as sharp as it could be. Aw, heck, no I don't. Although it's a pleasant task, I don't have time to sharpen knives like that. Maybe when I'm retired and then I give up cooking to subsist on canned beans and hot dogs, I'll have time to sharpen knives by hand. But at that point, my keepers probably won't allow me to have sharp objects. When I saw a unique looking knife sharpener from Brod and Taylor at the Housewares Show in Chicago this past March, I got a short demo of it at the show, and I was pretty impressed with what I saw and what they said. It was super-easy to use, even if you haven't a clue what angle a knife should be sharpened. You can sharpen aggressively, which removes metal from the knife, or you can hone the knife, or you can polish it. You can use it for serrated knives, too. And it's compact and interesting looking, so you can set it on a shelf and pretend it's modern art. I've sharpened my most-used knives and it was so easy it's ridiculous. It took no time at all. It's nearly foolproof as long as you remember that most knives only need honing and polishing, and that the aggressive sharpening is only for knives that are seriously beat up. Pros: Easy to use. Works well. Cons: It's a little spendy. There are less-expensive models from Brod and Taylor , but I haven't tested them. Wishes: Little hieroglyphics that show knife sharpening positions etched into the sharpener would be handy. Edit: I've just been informed (ahem) that there are handy pictures on the bottom of the sharpener that show exactly this. On the bottom. Where they don't mar the clean esthetic of the sharpener itself. I love how they read my mind before I had the thought. 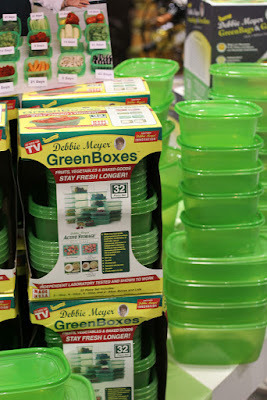 Years ago, I tried Debbie Meyer GreenBags and they worked really well to keep my produce from going bad as quickly. The problem I had with them (and this is just me, okay?) is that I'm not a huge fan of washing and re-using plastic bags. I like my dishwasher. I have some things I wash by hand, either because they deserve it, or because they don't fit in the dishwasher. Washing plastic bags and finding a place for them to dry is pretty low on my priority list. 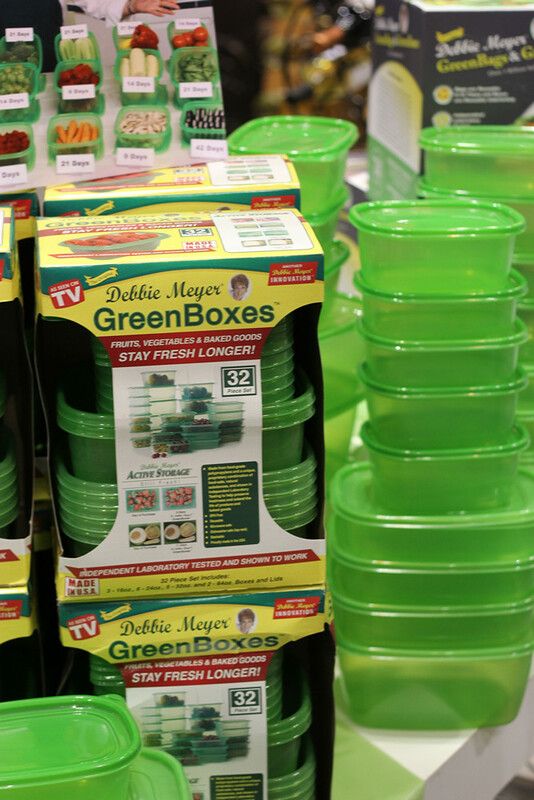 So when I found out there were green BOXES (I saw them at the Housewares show in Chicago earlier this year), I was pretty excited. They're just like regular storage containers, except that they're designed to keep your produce fresher. So you can store your strawberries and cherries in them, or the lettuce you prepped for tomorrow's salad, or the cut zucchini and cucumber that you didn't use for the recipe. And if you happen to use them for leftover spaghetti, there's no harm done. They're just as dishwasher safe as the non-green containers, and they nest and store neatly. What's not to love? But that's not all. 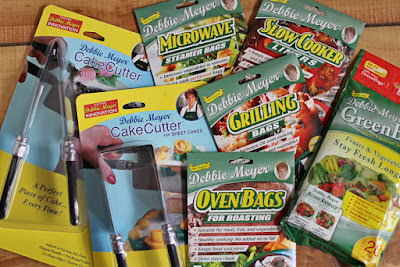 When I wasn't paying attention to the Debbie Meyer brand, she came up with a whole bunch of products. Besides the GreenBoxes (and the GreenBags that are still available) there are oven bags for roasting, microwave bags for steaming, slow cooker liners for ... uh, lining your slow cooker, and grilling bags for grilling. AND she has two cake cutting tools. One cuts wedges in round-shaped cakes and for pies, and the other cuts squares from square and rectangular cakes. That's a whole lot of stuff! 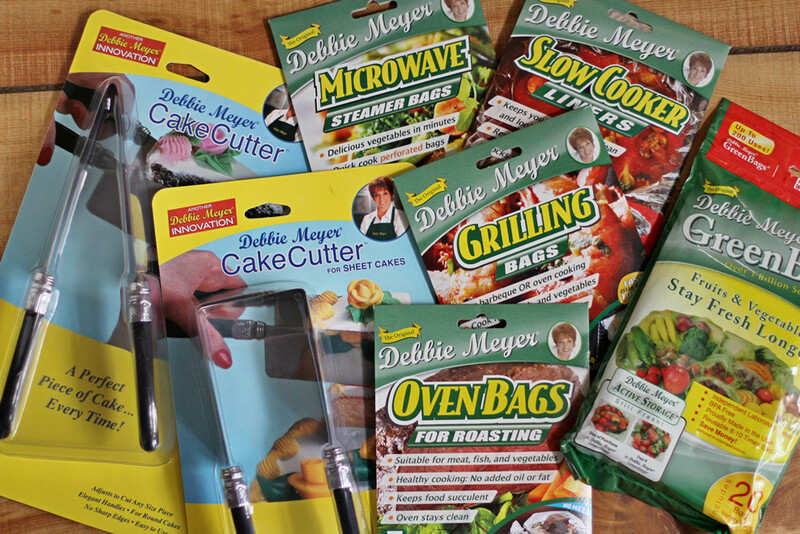 Which is your favorite Debbie Meyer product? Who's it for: So many products, so many uses! Pros: Love that the boxes are easier to clean than the bags. The variety of products is great. Cons: So much to choose from? 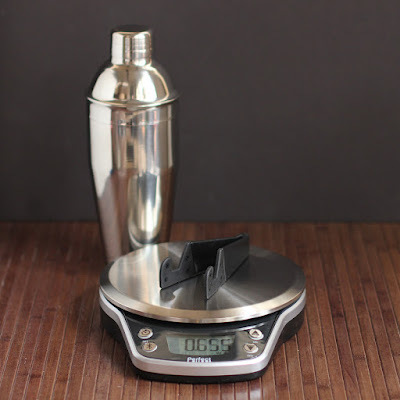 Okay, some of these might be a tad pricy for single-use, but it depends on your budget. Wishes: Maybe a sample pack of the grilling, oven, microwave, and slow cooker bags, so you could try them all. I didn't, until they contacted me. But I'm going to get to know them pretty well, I think. They're sending me boxes so I can sample, write, use, cook, eat, share. The first one was pretty impressive. Most of the products were full-size and the rest were nice single servings and not just tiny samples. There were some major brands and some less-well-known. Some things to cook with, and some to snack on. If you can't read 'em all, there was Jif cinnamon peanut butter, Soy Vay teriyaki, Brianna's vinaigrette, Elmhurst Harvest chocolate almond milk, Topo Chico mineral water and sparkling water, Wise popcorn (sea salt and Cinnabon flavored), Honees menthol and honey lozenges, Vita coconut oil, Haribo sour gummy bears, and Orchard Valley nutty snacks. The company estimates the value of the box at about $30, which seems about right, if you could actually find all of these where you shop. They sell for $19.99, which is a good deal, right? But wait! It gets better. I've got a coupon for ya. Order a box with the code R7TXK and you'll get 50 percent off, so you'd pay $9.99 for the first box. I'll have to admit that I haven't tasted everything yet, but I'm working on it. 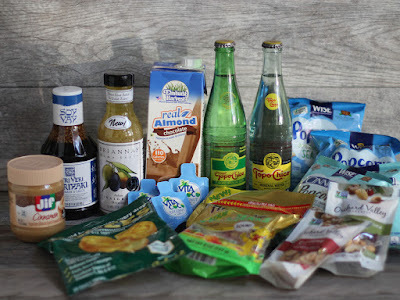 I've used other Soy Vay products in the past and I've liked them a lot, and the Orchard Valley snacks disappeared really quickly; the cashews were my favorite. The Topo Chico mineral water was tasty, and I'm saving the sparkling water for a cocktail later. Jif cinnamon peanut butter was different, for sure. Meanwhile, almond milk is in the fridge, chilling, and the rest of the items are waiting for me to rip them open. If you like sampling different products, I'm sure you'd have a blast with this. I'm not sure how long I'll be reviewing these, but if the quality stays this high, I should stick with it for a while. I love trying new products in recipes, and this is a risk-free way to do it. And if I get something I don't care for, food is always sooooo easy to give away. DON'T FORGET THE COUPON! Use R7TXK to get half off your first box!